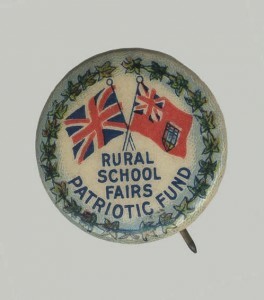 Patriotic funds had existed in Canada for over a hundred years. Mainly private initiatives, they took donations from individuals and businesses to support soldiers and their dependents, during and after wars. 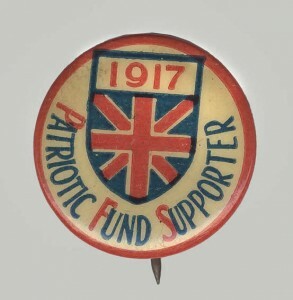 Montreal social activist and manufacturer Sir Herbert Ames followed these precedents in August 1914 in establishing the Canadian Patriotic Fund (CPF). A private organization with the Governor-General as patron and the federal minister of finance as treasurer, the CPF would raise nearly $50 million for soldiers’ families, distributing it through a vast network of local volunteers. 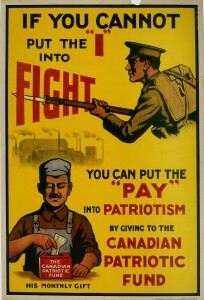 The Fund urged Canadians “to fight or pay,” and sought to reassure married men – 20 per cent of all Canadian soldiers during the war – that wives and families would be cared for in their absence. The CPF performed its principal tasks – fundraising, relief, and the provision of social advice to recipients – with conservative views on entitlement and moral virtue firmly in mind. Fund investigators, including hundreds of women, acted as volunteer social workers, visiting families to determine their level of need or eligibility, and often advising them on how to manage war-related social issues such as budgeting, child care, nutrition, and personal hygiene. Recipients considered undeserving could be dropped without appeal. 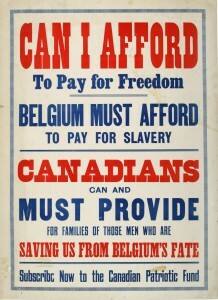 The CPF and other private initiatives performed essential work, but the war convinced most Canadians that support for soldiers’ families was a public responsibility. During the Second World War, the CPF would not be reinstituted and soldier welfare would be handled by the federal government. This was an important component in the growth of Canada’s welfare state. 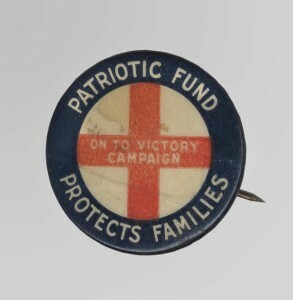 A button awarded to contributors to the Canadian Patriotic Fund. Money voluntarily given "protects families" of the soldiers who are serving overseas.